Free gummy vitamins at CVS! 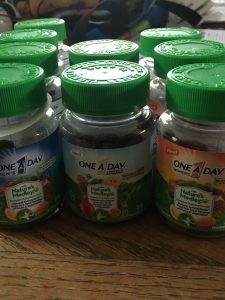 Combine the $4 sale price of the One A Day Nature’s Medley gummy vitamins with the $4 coupon in 9/9 S2 and you’ll pay low tax – these nine put me 63¢ OOP. Unfortunately, they’re only 28 ct, so at two per day, you’re talking two week supply, but still – THEY’RE FREE! Coupons are only good for two weeks, so if you get a rain check, keep checking inventory.